Since 1971, the Libertarian Party has supported LGBTQ rights – even before there was an official “LGBTQ” designation. As Libertarians, we promote and defend our fundamental rights to life, liberty, and the pursuit of happiness, common to all human beings, regardless of color, religion, heritage, political philosophy, or sexual orientation. 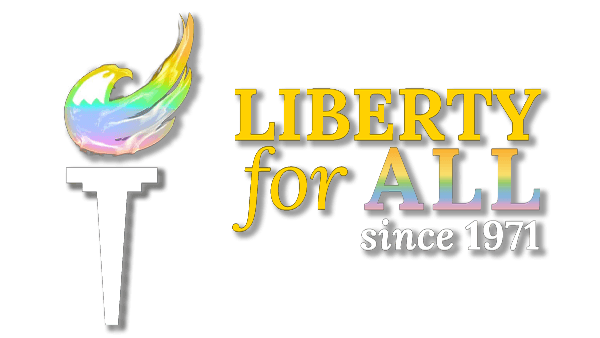 On Saturday, June 17, the Libertarian Party of Rhode Island will promote the message of freedom at a booth at the 41st annual Rhode Island PrideFest in Downtown Providence, along South Water Street. We are asking for volunteers to help staff the table for about four hour periods. On the table, there will be literature to distribute, register-to-win forms for a gift basket, and Libertarian “swag” giveaways. The early shift helps set up and the last shift helps pack up. We will also march in the illuminated night parade, carrying the Libertarian Party of Rhode Island banner. The parade route begins on Dorrance and Weybosset Streets, continues along Washington Street, then Empire Street, and traveling past the reviewing stand. Would you like to join us at the booth, march in the parade, or both? The first period is 10:30 a.m. to 2:30 p.m., second period is 2 p.m. to 6 p.m. and the third period is 4 p.m. to 8 p.m. The parade steps off around 8 p.m. Please complete the form on this page. We need about 5 people for each of the three time blocks, and at least 6 to march – that’s up to 21 volunteers total, so plenty of opportunity for YOU! We look forward to seeing you. Help us promote liberty in RI. If you are interested in helping the Libertarian Pary of RI at this year's RI Pride event in Providence please fill out the form below.